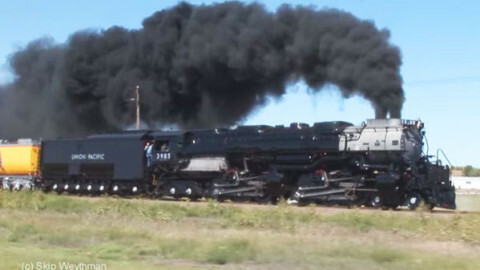 Union Pacific 3985 Highballing At Top Speed! HIGHBALL, yard on it, pull’er back – Maximum allowable speed. Also, a “highball” is a signal given the conductor when the train is ready to depart. Once again we have excellent footage of UP 3985 barreling down the tracks on the Union Pacific lines. Like her sister engine, UP 844, she is now being used for excursions and occasionally short haul freight duty. Also, like her sister, UP 844, she is called upon to pull the Ringling Brothers and Barnum & Bailey Circus Train when called upon.